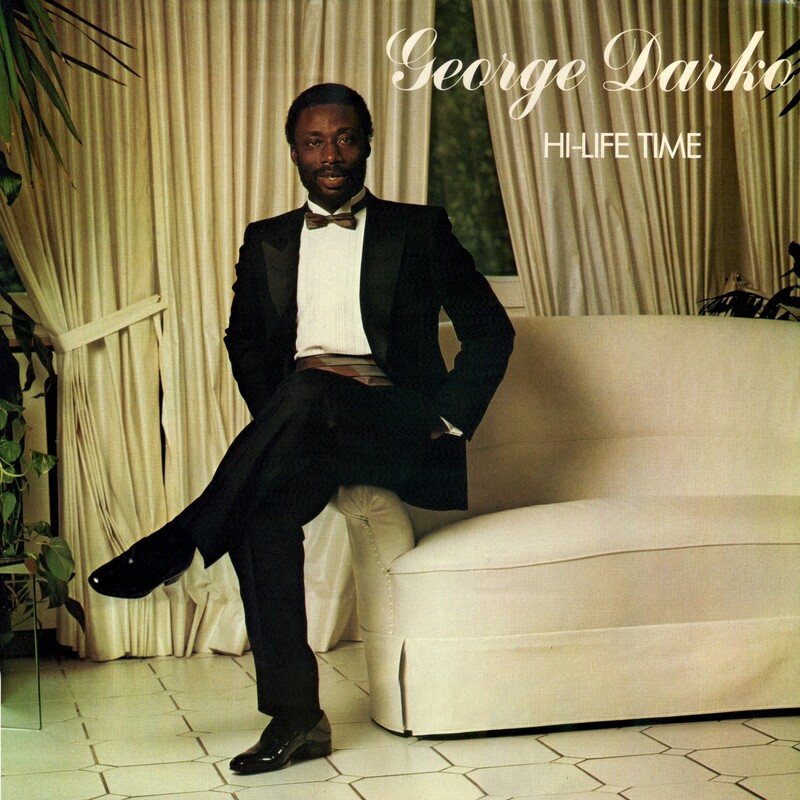 Over the last few months I've been posting a disproportionate amount of sweet Ghana highlife from the '80s. I just happened to digitize quite a bit of this music a while back and I'm sure you don't mind! 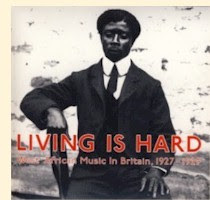 I've discussed here also the circumstances that led to so much of this music being recorded and produced outside of Ghana - an economic crisis that resulted in many musicians finding refuge in West Germany, Canada and other far-flung places, including the US. I present today a product of the thriving Ghana music scene in the United Kingdom. Of course, because of their shared colonial history, Britain has always been a destination for citizens of Ghana, economic crisis or not! I've been unable to find out anything about this musician, Nana Budjei. 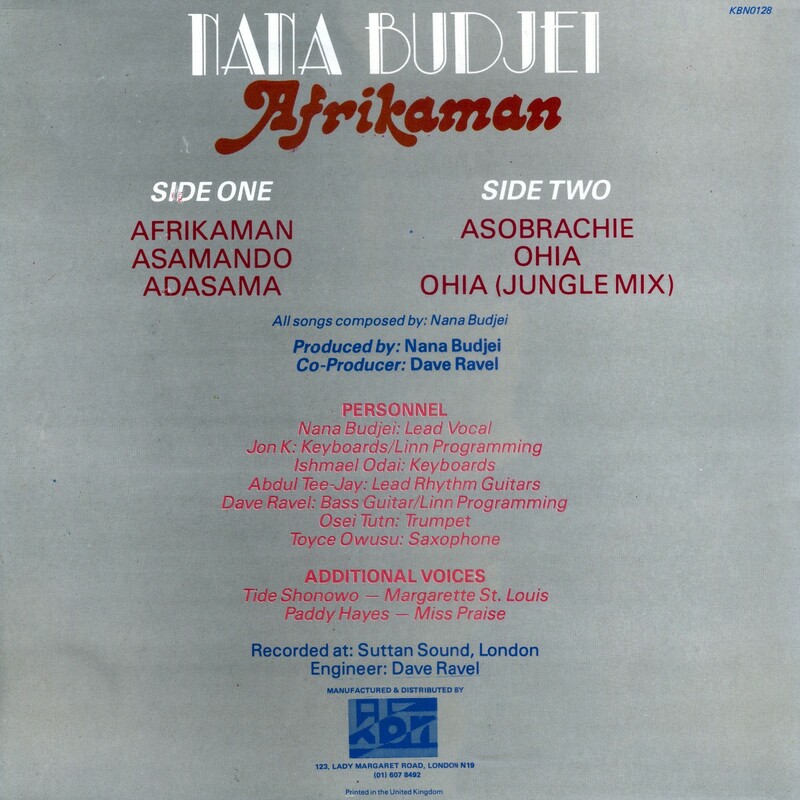 The album, Afrikaman (KBN 02, 1989), is a great example of the sort of sparkly, innovative highlife that was being produced in London during this period. 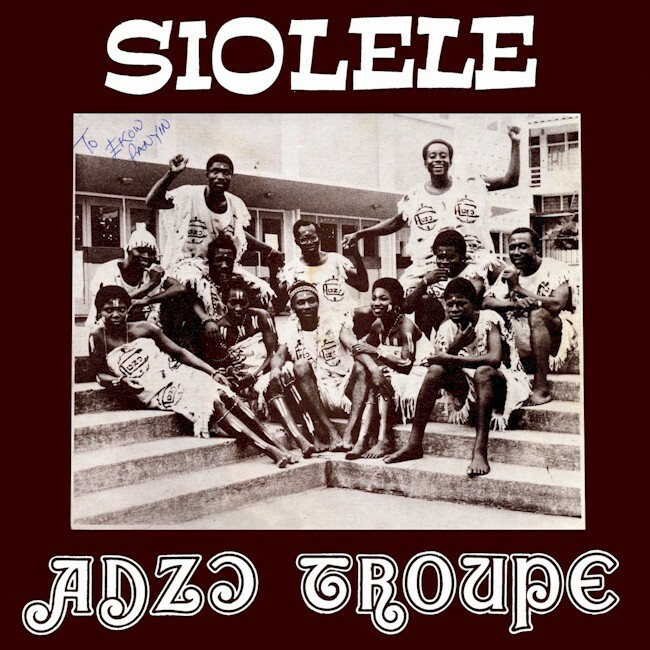 Especially notable is the soukous-flavored guitar work of Sierra Leonean Abdul Tee-Jay. Very nice! Nothing much else to say. Enjoy! Download Afrikaman as a zipped file here. 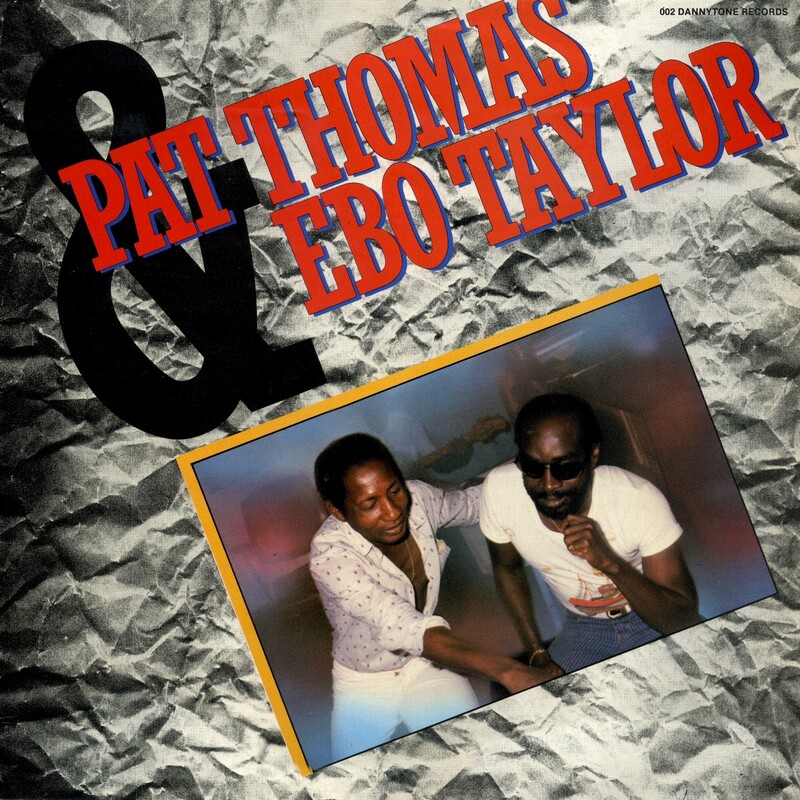 The two stalwarts of Ghana highlife, Pat Thomas and Ebo Taylor, have both been experiencing career revivals lately, thanks to new recordings and reissues of old material. As a team - with Taylor as guitarist and arranger, and Thomas contributing his golden voice - they've been together on and off for more than fifty years. I've written about Pat Thomas and posted his music before. 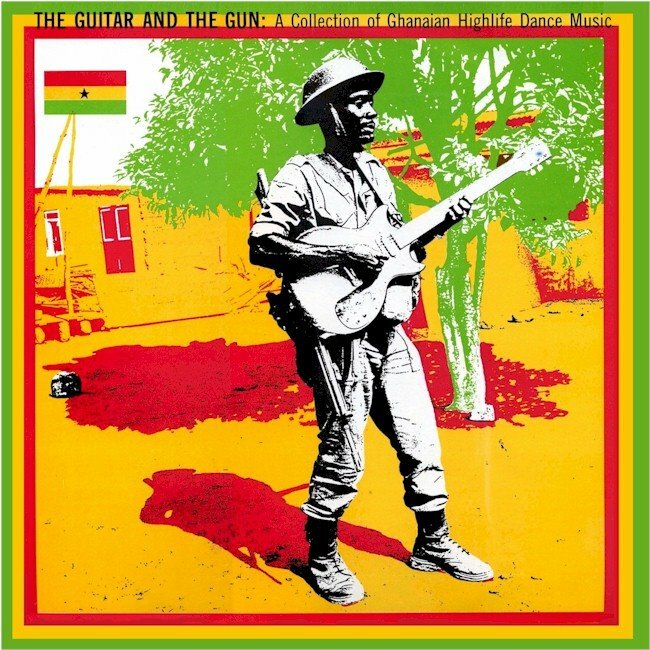 Ebo Taylor has recorded with all manner of Ghanaian musicians as well as being a session musician for the very influential Essiebons label. 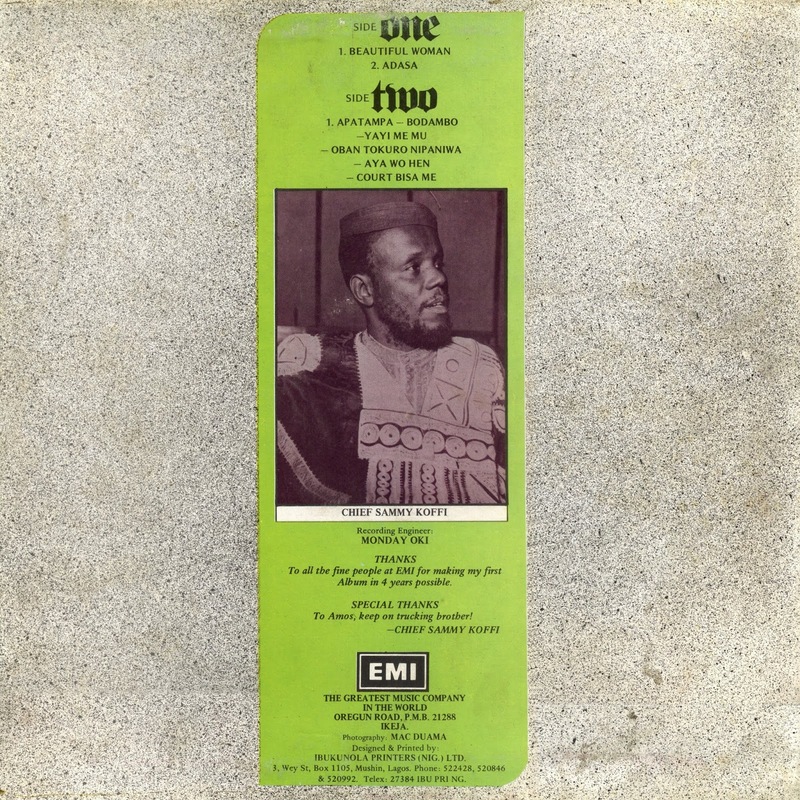 Today's offering, Oye Odo (Dannytone 002, 1984), recorded in Ghana and mastered in the Netherlands, showcases these two giants at their peak. Enjoy! Download Oye Odo as a zipped file here. 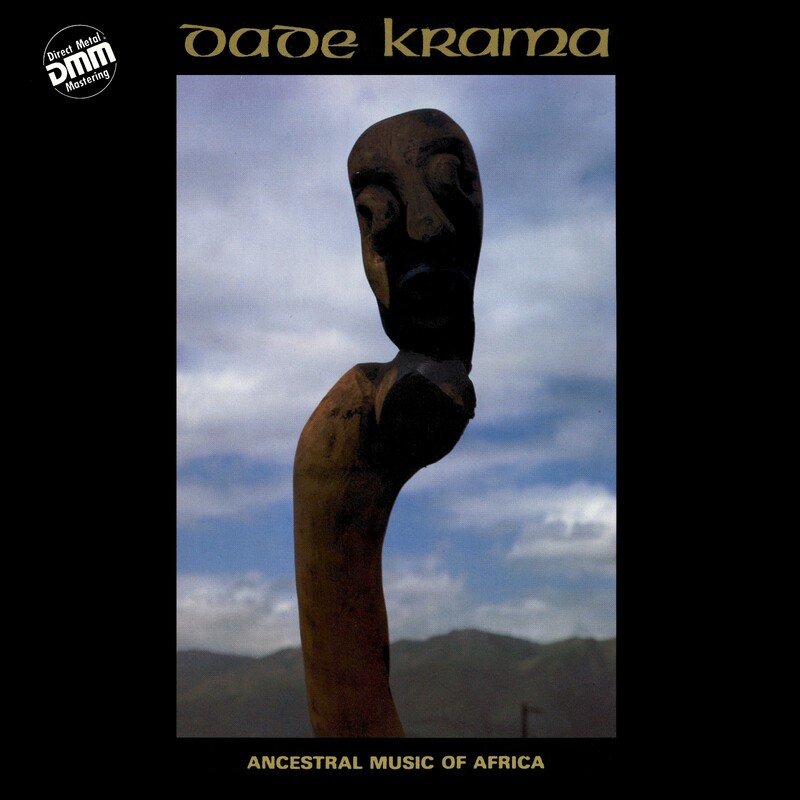 The sensational quintet, Dade Krama are storming Britain's major cities with their soothing, sometimes cheering or even inciting, yet elusive ancestral music of Africa. At the time I caught up with them on their travelling programme, they had already enlivened London, Leicester, Leeds and Birmingham. I decided to find out what their fans in Manchester had been missing. ...Word got around that the great big-band highlife maestrro, E.T. Mensah was in the audience (he is in Britain for a medical check up). The next song had to be dedicated to him: "Wo se gye shun noni ete- noni eba-ye" - "we've come from afar, what has gone, what has come we endure." The song was so heavy-handedly nostalgic that it made one want to reach out for a steaming meal of kenkey, a giant hairy-legged land crab steamed to a red-brick colour with hot Kpakpo shitor (pepper). A bottle of real unadulterated akpetechie would have been great! I spoke to Nana Tsiboe and Dada Lamptey: what strategy did the group have in getting across the ancestral music of Africa, considering that Western audiences may find the instruments, lyrics of music strange? "We believe, and to some extent have found out that only by the use of a creative format on the basis of a traditional platform can our music develop. For a long time African musical instruments, for instance, developed without the interruption of Western instruments. With regards to the lyrics, our songs could not be sung in English - the feelings come across with minimal translation. "...People hesitate to appreciate the proper context within which our music is realized. I can only comment on what we are doing in the sense that we try as much as possible to project our African culture so that it is appreciated in a proper perspective. We are now more than a music group, we are a way of life. Our music fits into our way of life - it is a lifelong thing. It demands, we are aware, a very delicate kind of exposure, care, thought and presentation." What is Dade Krama's position on blacks here in Britain and elsewhere in the West? "It is essential for every black to know he or she is black. We try to advance this basic consideration through the medium of our music - that is total glorification of our own musical culture." "...There are African people fighting and infiltrating on other levels - we can help by producing .a very bigh level of our art and linking up. It is like a call to all black people to say, hey look this is what you are made up of!" Will the group continue to be im England? "No, presently England needs to be used to popularize our music. It is also important to make our music audible. We have to rely on the technology of this part of the world. All members of Dade Krama have backgrounds in Western music or have used Western instruments. When was the break? "It is the instruments that broke us - we can't rely on electric current to make music for our audience. It is only efficient musicians who can play African music. In getting together, we all had the same interest and decided to share our instruments communally. " You make your own instruments? "We make some of the instruments like Gonje, Brekete and Gai. We attempt to repair our damaged instruments and in the long run make them ourselves." How is the group's debut record faring? "The'LP is three weeks old. We would say it has sold to a fair percentage of' our audience at performances. Also response in the form of write ups, and radio interviews has been great." Dade Krama comprises: Nii Noi Nortey - former saxophonist and flautist with Misty in Roots and African Dawn; Nana Tsiboe - formerly with Jazz Africa, High Tension and the Afro-Rock group Ojah (which he led); Dada Lamptey - a filmmaker/graphic designer (he designed the sleeve of Dade Krama's new album), who played with Watusi and Eneaben V; and Kweku Gabrah, who worked with the highlife group. Carousel 7 and has since been a sought-after session percussionist. Afari Aboagye, a professional agricultural economist, administer them. When the lights of our ancestors dimmed, the crowd called for more. Afari routinely pleaded with them to come back. They did, but not with instruments: they formed a circle and with sleight of hand clapped a tune from our youth: Sasakroma (the hawk) out of each other's hands in the ecstatic manner of a group that had had a truly successful evening. 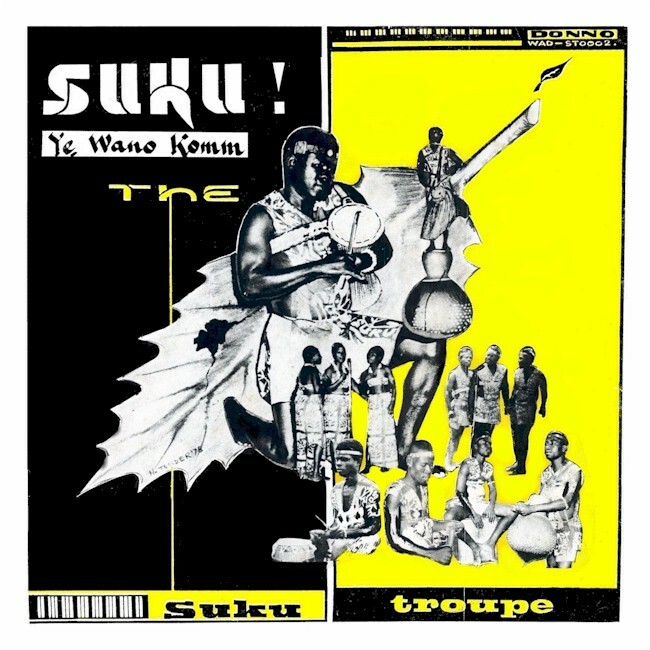 Dade Krama's uncompromising approach to their music was admirable at a time when many African musicians felt the need to "cross over" - water down their art in hopes of commercial success. Probably for that reason their following was somewhat limited. 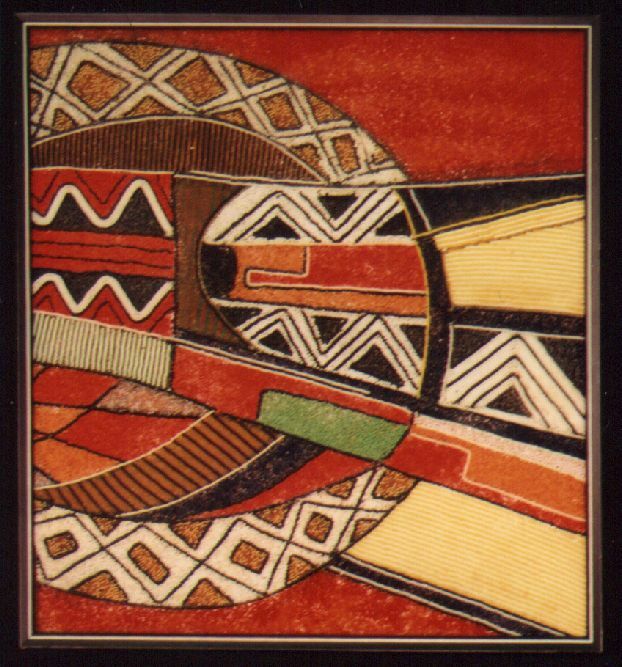 Discogs lists only two releases by them - Ancestral Dance (Round Music ROCD 9601), which came out in 1996, and their debut, the one we're going to hear today, 1986's Ancestral Music of Africa (Akoben AK1). 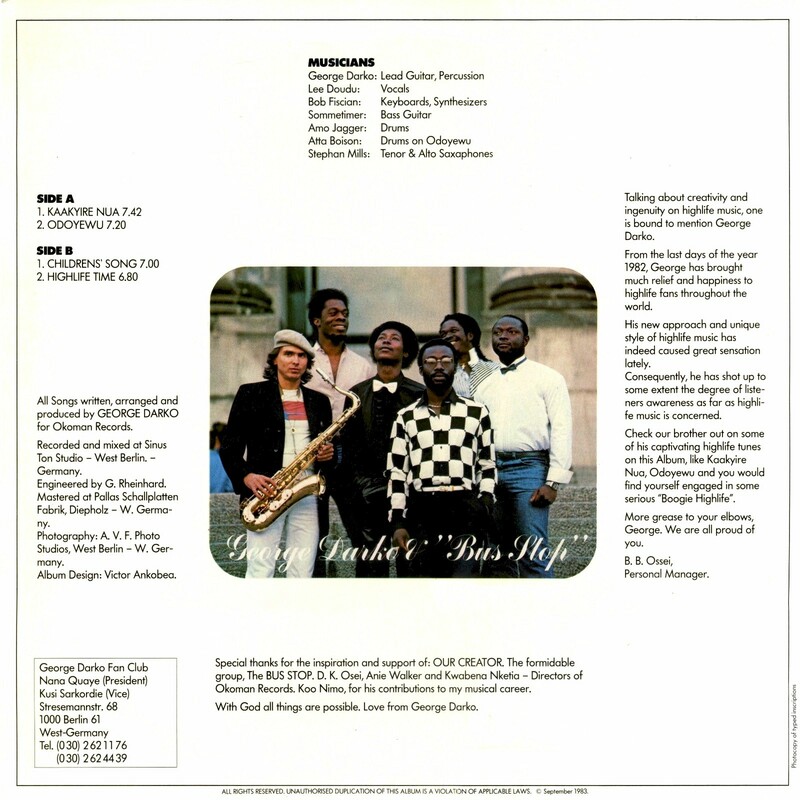 Descriptions of the songs are taken from the above-cited article by Kofi Hagan Jr. 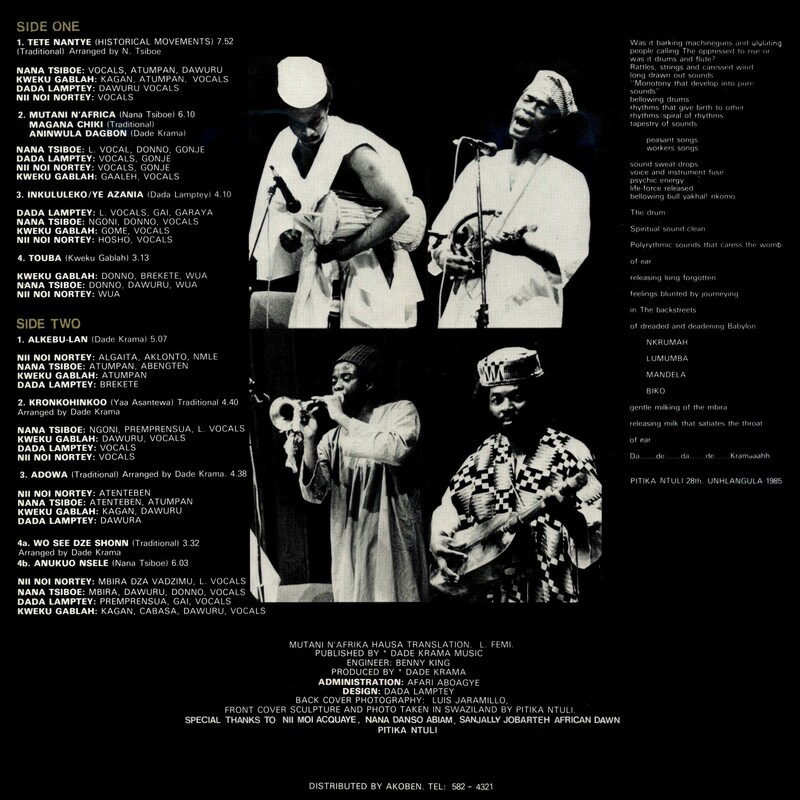 "...Using the Mbira (hand piano), Gonje, rattles, etc., Dade Krama performed 'Mutani N'Africa' - a Hausa tune and 'Magana Chiki' in a medley..."
"...'Touba,' a mobilizing arrangement employing the use of Atenteben (flutes) and percussive instruments in an increasingly rapid rendition of a Northern Ghana tune..."
"...'Brothers, sisters and fans, two years ago Reagan invaded Grenada and stifled the revolution. A few weeks ago he dropped bombs on Libya with the assistance of Thatcher. Two days ago with the knowledge of Reagan and Thatcher South Africa invaded Botswana, Zambia and Zimbabwe...We dedicate this song to all freedom fighters.' Wild cheers of approval from the audience. 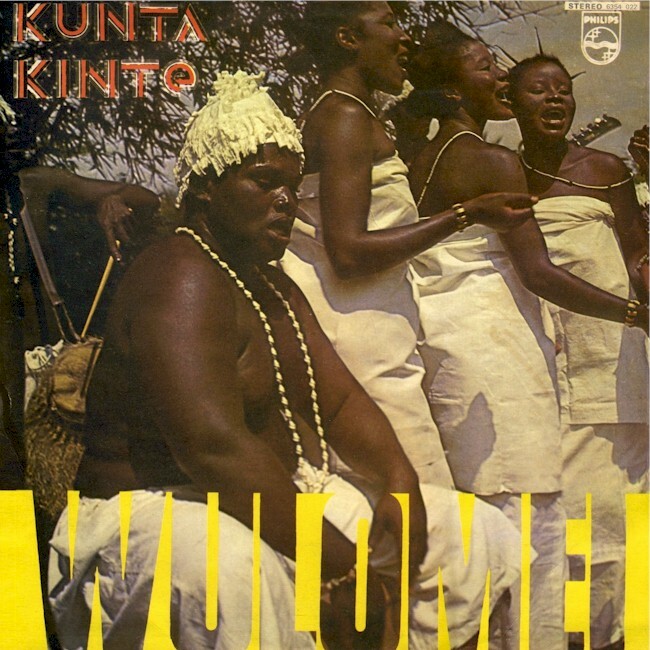 The song, 'Alkebu Lan,' - the original name of Africa, started with a bee-like droning sound from a pipe horn. Then the solitary whine of the Algaita - the instrument snakecharmers use, reared its lethal head and gave a lightning strike at the real cradle of State Terrorism. The recurrent sombre thums of the Brekete and Fomfomfron drums merely beat a warning to weakened hearts..."
Download Ancestral Music of Africa as a zipped file here. A few words on the inscription "Direct Metal Mastering" that appears on the sleeve. This technology appeared in the waning years of the analog era, probably in competition with digital recordings, which were then appearing on the market. 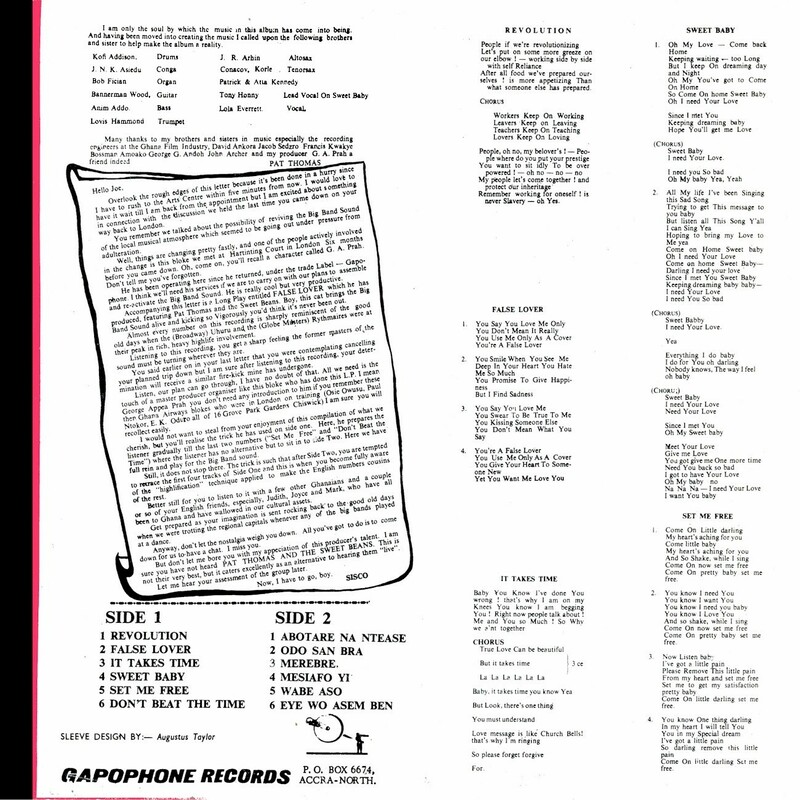 I'm generally unconvinced that analog recordings are superior to digital (at least these days; a lot of the early CDs did sound awful! ), but this record makes a good case! I was struck by its remarkable clarity while digitizing this disc. Something to look for if you're really into vinyl records! For more information on the process check out this Wikipedia article. Last month I gave you A.B. Crentsil's great 1985 LP Toronto by Night, with a promise of more sophisticated sounds from the king of '80s Ghana highlife. Well, here they are! 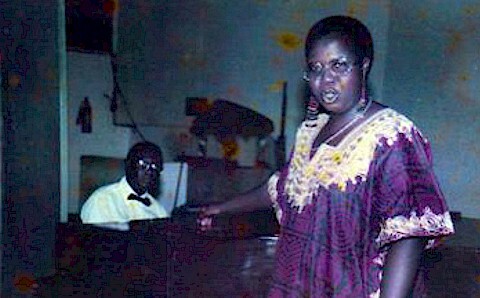 Tantie Alaba (Earthworks/Rough Trade ERT 1004, 1984) was recorded at the Ghana Film Studios in Accra, and has more of an "organic" sound than Toronto. The dramatic plunge in the value of the Ghanaian currency, the cedi, has thrown up some stories. One of the most heartbreaking is the virtual death of the Ghanaian recording industry. The price of imported basics, like guitar strings or vinyl, has killed off virtually every full-time touring professional band. Some put the number of survivors as low as three. One man who has survived all this and a lot more is A.B. Crentsil, the 36-year-old singer whose mid-1970s band Sweet Talks was a germinating ground for some of the strongest talents to emerge out of Ghana during the last ten years - the Sunsum Band, Eric Agyemang and Thomas Frempong among them. But the figures even he throws out so casually are terrifying. He starts off talking about how his second band the Lantics were stolen away from the Atlantic Hotel by an extra 25 cedi a month - "100 cedi a month was a lot and we were happy to go!," he chuckles. Now he talks about paying his bus driver 10,000 cedi a day, a week, a month, whatever it takes to keep him. Even more scaring is his account of the break-up of Sweet Talks in 1979 and the court battle to get money out of the manager of the Talk of the Town Hotel who owned the band's instruments and in a lot of ways seemed to own their souls as well. "In court we heard that Phonogram had paid him 5.4 million cedis. Out of that we had seen 68,000 cedis." Needless to say there were dark doings in the background and A.B. is not a rich man - but her survives. And away from the numbers, back to the music. Throughout the 1970s A.B. played in the best hotel bands in Ghana - first the El Dorados, performing funk, reggae and James Brown material, the usual songs known as "copyright." The there was the Lantics, again tied to a top hotel but this time getting away to record the first album, Adam & Eve [as the Sweet Talks] in 1975. They had been spotted playing in the hotel by Phonogram MD Arthur Tay who swept them off to the 16-track EMI studio in Lagos which was quite a jump from the two-track they had used for three 45s earlier. 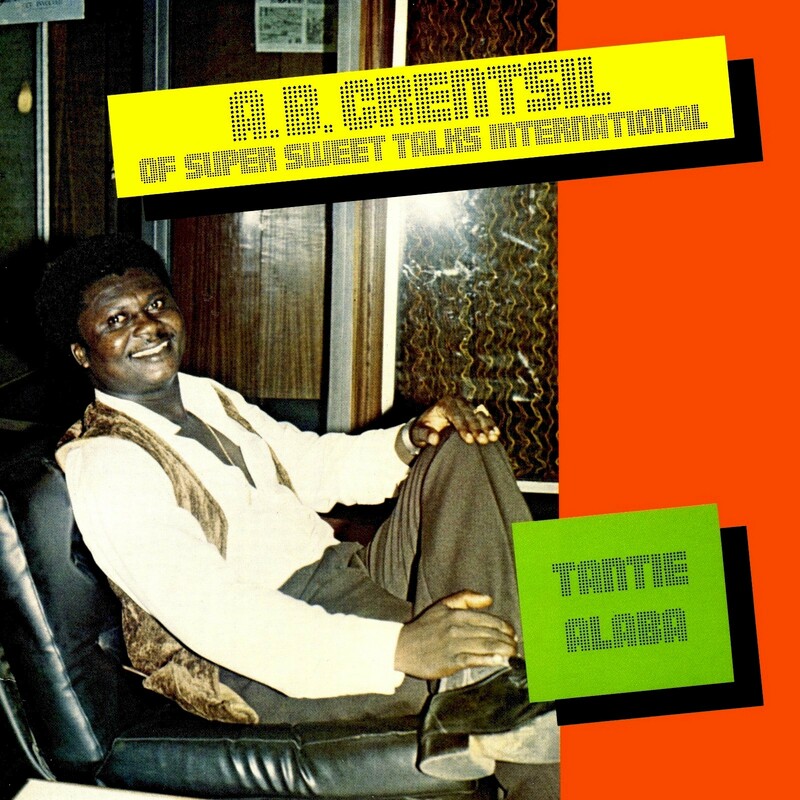 Which brings us up to 1984, and Tantie Alaba, recorded with Mr. Crentsil's reorganized Super Sweet Talks International, and the first of his albums to receive modest international distribution. Here's a nice video someone made of the title track, utilizing footage that apparently has nothing to do with the song itself, but, I'm sure you'll agree, matches up very well indeed! Download Tantie Alaba as a zipped file here. Mmmmmm . . . Sweet '80s Highlife Music! 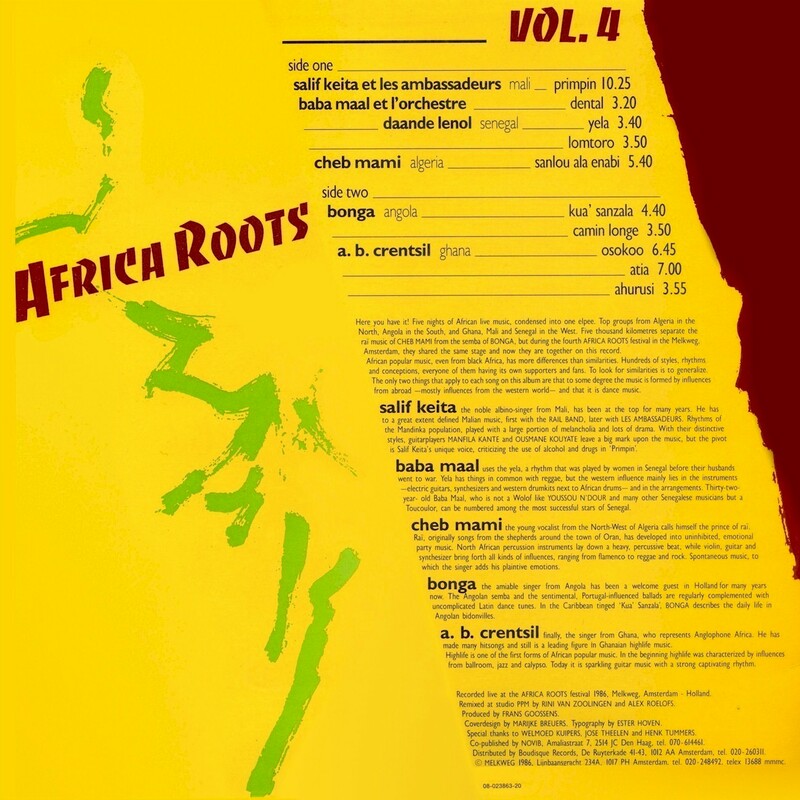 I've been going through my record collection, pulling out and digitizing Ghanaian LPs that I got hold of back in the '80s when I was a regular customer of Sterns African Record Centre in London. Most of these were recorded in London, Berlin and Toronto, the economy in Ghana at the time having forced some of the biggest stars there to seek sustenace overseas. 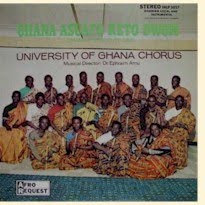 The result was a new, hybrid sound, marrying the standard themes and sounds of Ghana highlife with modern production values, synthesizers and drum machines. 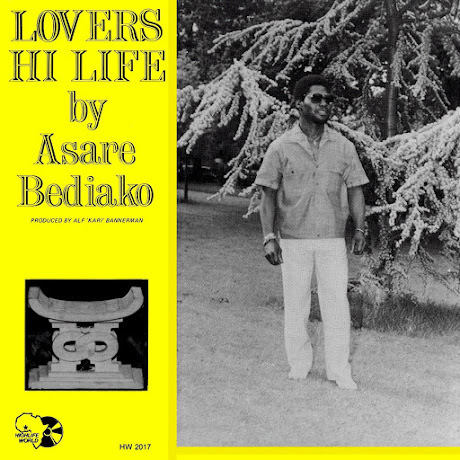 Over the next weeks and months I'll be presenting the results of my excavations, but I think it's only fitting to open with an LP that stands as a pinnacle of the '80s Ghana highlife sound - A.B. Crentsil's Toronto by Night (Wazuri WAZ101, 1985). Alfred Benjamin Crentsil was born in 1950 and showed an early aptitude for music, forming with his friends in the mid-'60s a group called the Strollers Dance Band. A few career moves later and he founded, with Smart Nkansah, the group that would make his name, the Sweet Talks. 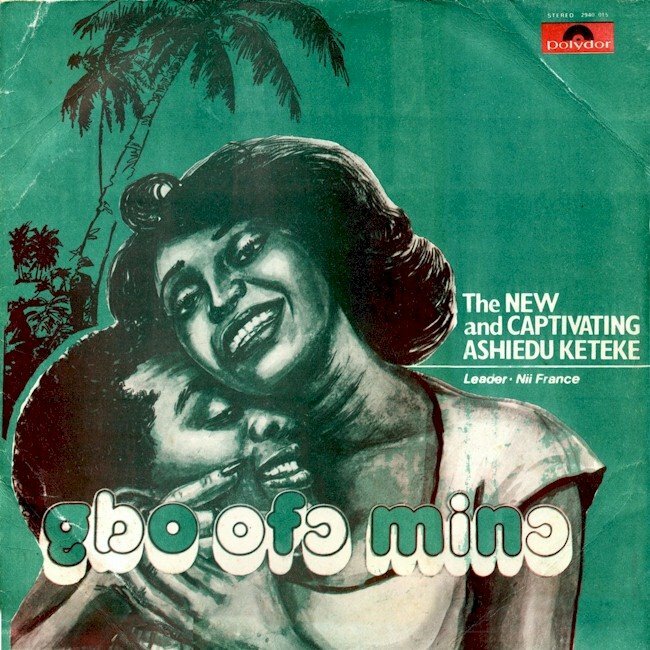 Their fledgling effort, Adam and Eve in 1975, almost single-handedly rescued highlife music in Ghana, then under assault by assorted foreign styles. 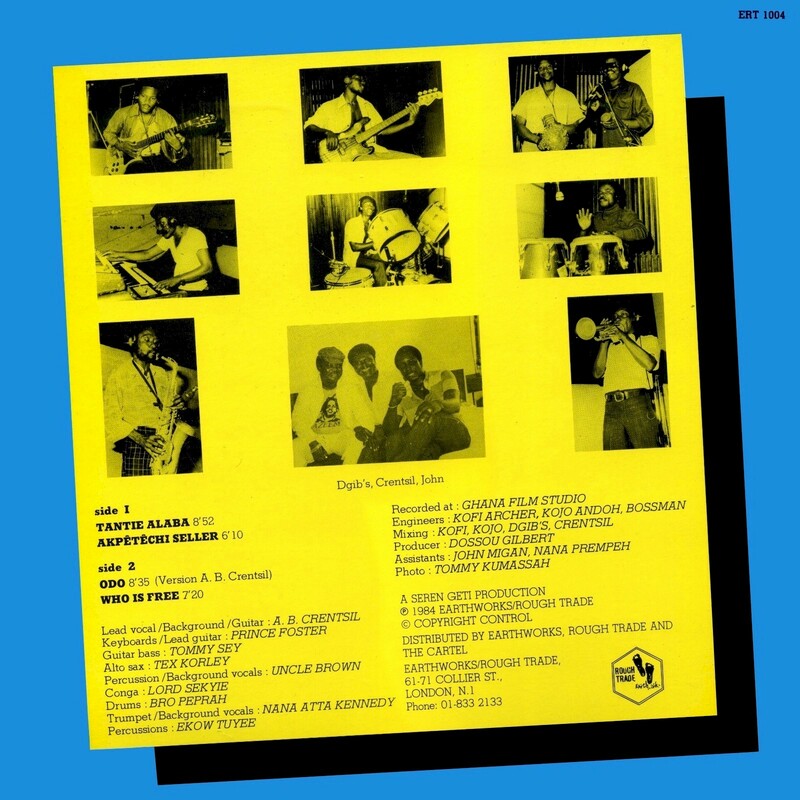 Many more hits - Kusum Beat and Hollywood Highlife Party (recorded in the US in 1978 when the band was playing backup for the Commodores) among others - and the Sweet Talks were at the top of their game. 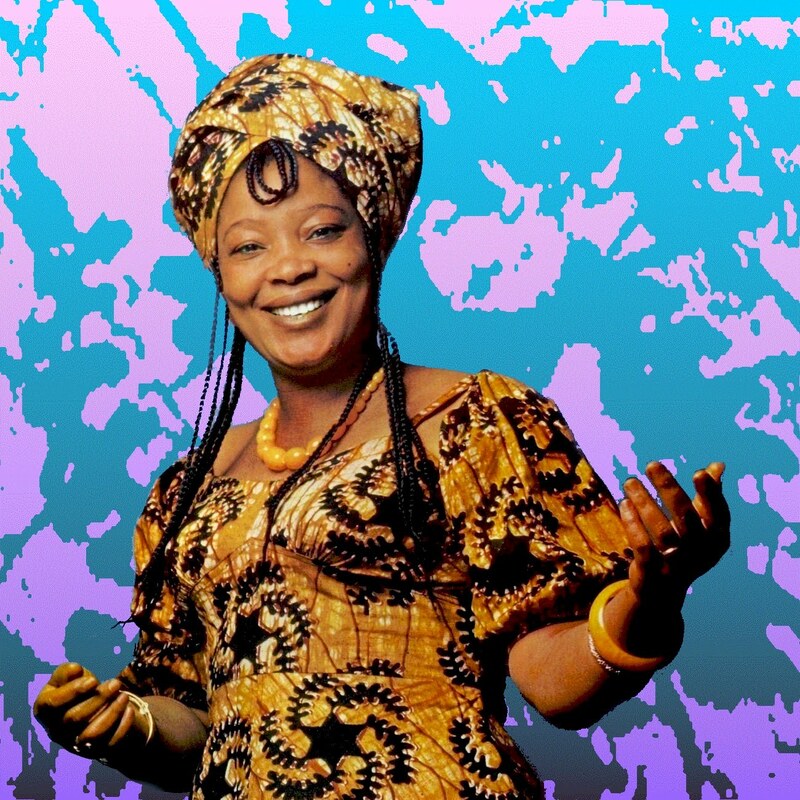 As is often the case for African musicians, dissension set in and the classic Sweet Talks lineup was no more. 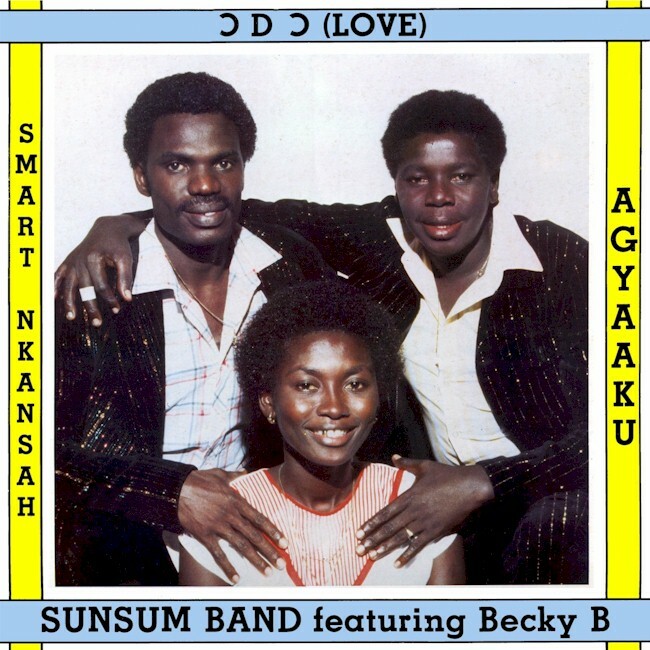 Smart Nkansah left to found the Black Hustlers (later named the Sunsum Band) and Crentsil carried on with the Super Sweet Talks International. 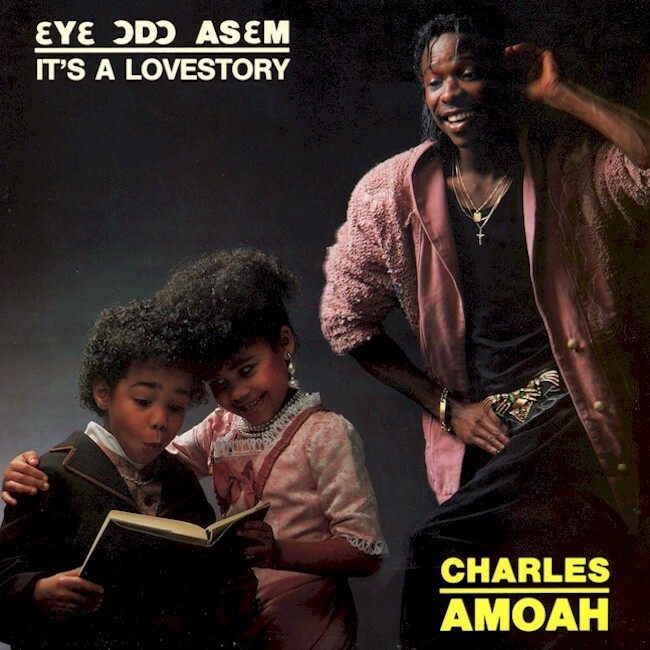 More solo recordings followed (among them the controversial Moses), and Crentsil found himself in Canada, where Toronto by Night, a certified classic, was recorded. Crentsil has been back in Ghana for many years and is still recording. In 2016 he received a Lifetime Achievement Award at the 17th Ghana Music Awards. Download Toronto by Night as a zipped file here. 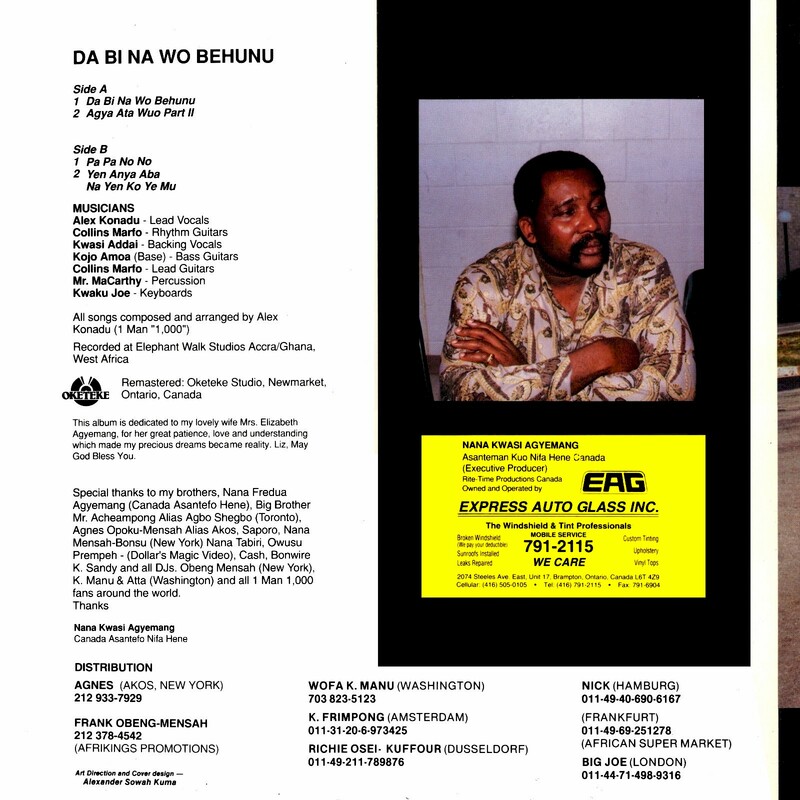 Ronnie Graham's article from the August 11, 1986 issue of West Africa magazine, "A.B. 's Highlife Humour," was extremely useful in researching this post. Whatever. 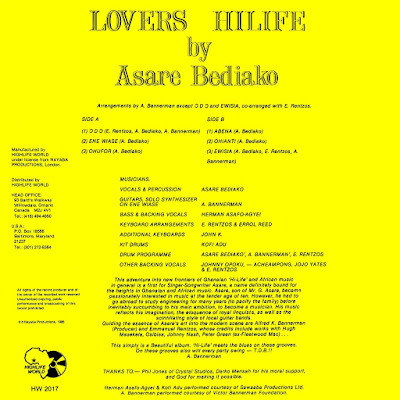 Lovers Hi Life is a pretty good example of the sort of synth and drum-machine driven "Burger Highlife" music that became popular in the 1980s. Enjoy! 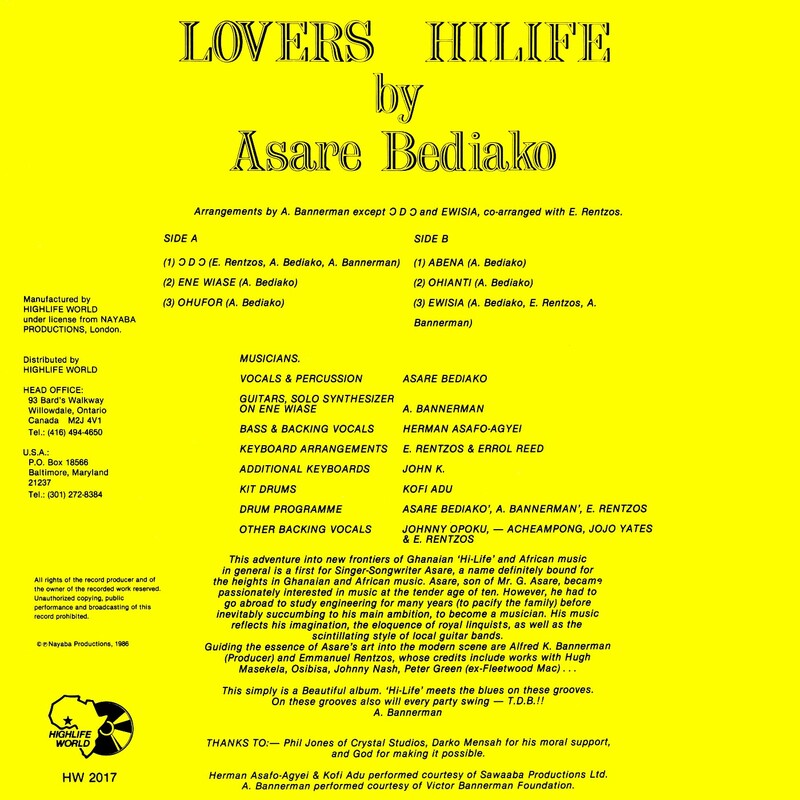 Download Lovers Hi Life as a zipped file here. Highlife Music From the "Great White North"
Ghana's highlife great Pat Thomas has been experiencing something of a career renaissance lately. 2015 saw the release of Pat Thomas & Kwashibu Area Band (Strut STRUT126CD), his first new recording in many years, and in 2016 a 2-CD retrospective of his recordings from 1964 to 1981, Coming Home (Strut STRUT147CD) hit the scene. Thomas has been around for many years. 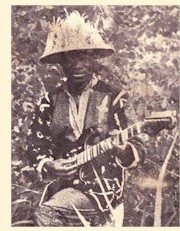 He was born into a musical family in 1951 (his uncle was the legendary King Onyina), but got his first big break in 1966 when he made the acquaintance of Ebo Taylor, a musician who had studiend in London with Nigeria's Fela Ransome-Kuti. 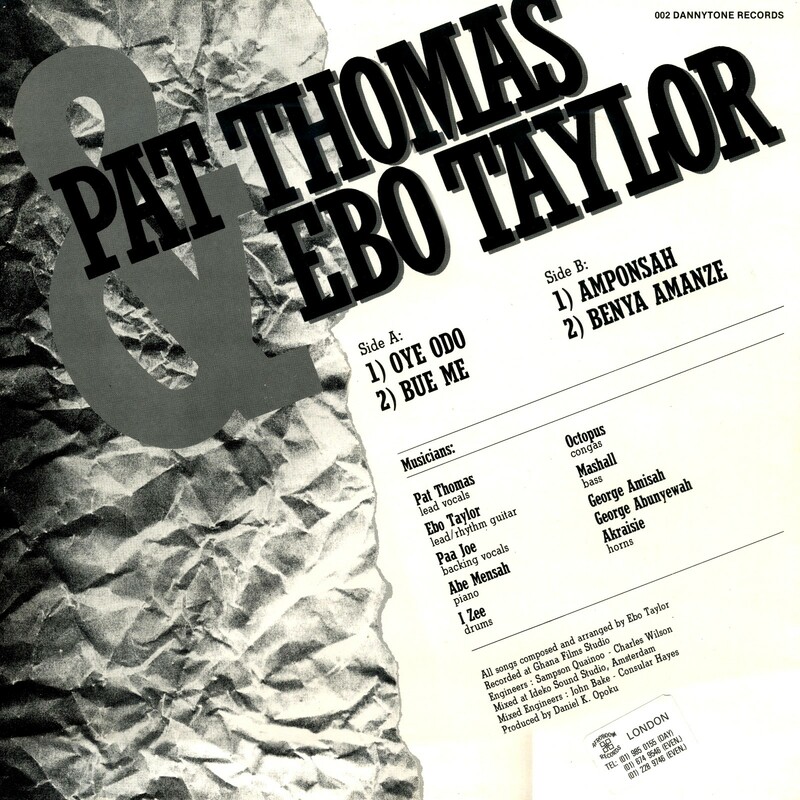 Thus began a musical partnership that would continue on and off for many years, producing a number of fine recordings and revolutionizing the Ghanaian music scene.Together, with Ebo on guitar and Pat as arranger and vocalist, they played in the Broadway Dance Band and the Stargazers, two of the most important orchestras of the era. 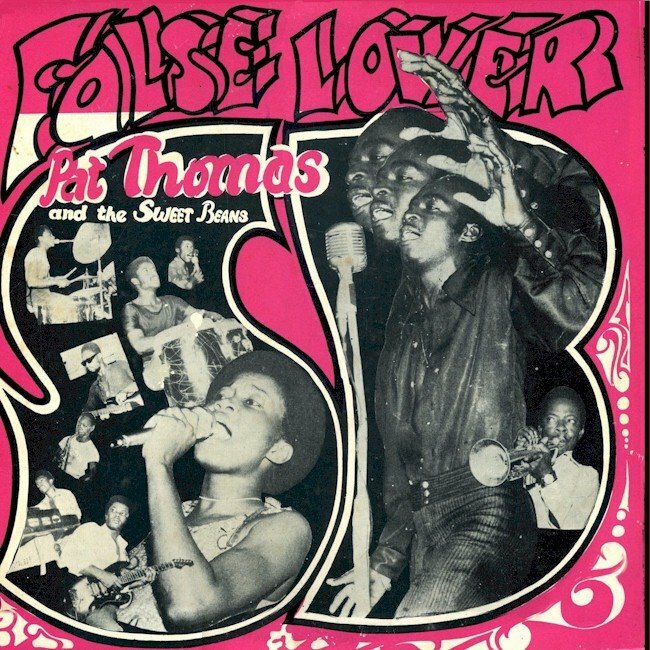 Thomas's breakthrough as a highlighted artist came in with the release of 1974's False Lover (Gapophone LP 02), recorded with the Sweet Beans, official band of Ghana's Cocoa Marketing Board. A few tracks from this landmark recording are included in an earlier post here on Likembe. 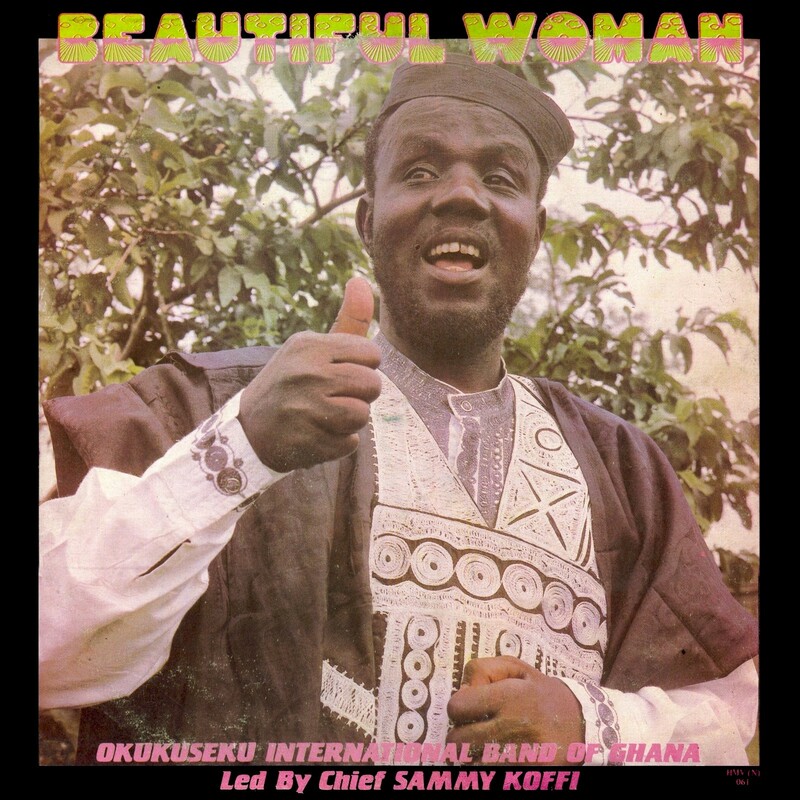 Ghana's political and economic travails in the early '80s impelled many musicians overseas, to London, Germany and Toronto, which gave rise to new and exciting permutations of the highlife sound. 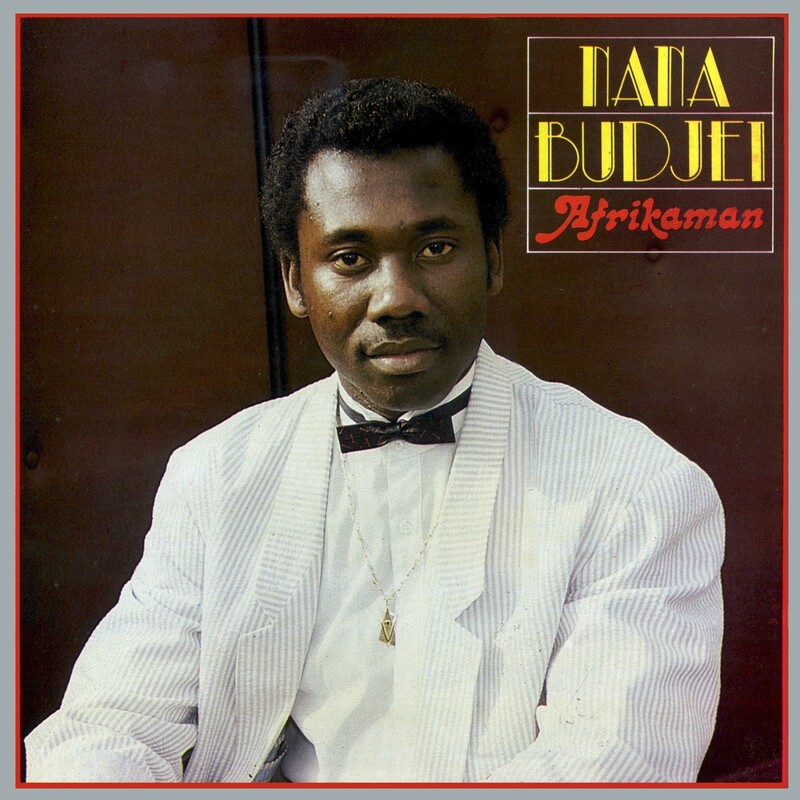 Ghanaian musicians in Germany, where Thomas lived for a time, developed a disco/highlife hybrid called "Burger Highlife," which took Ghana and its diaspora by storm. 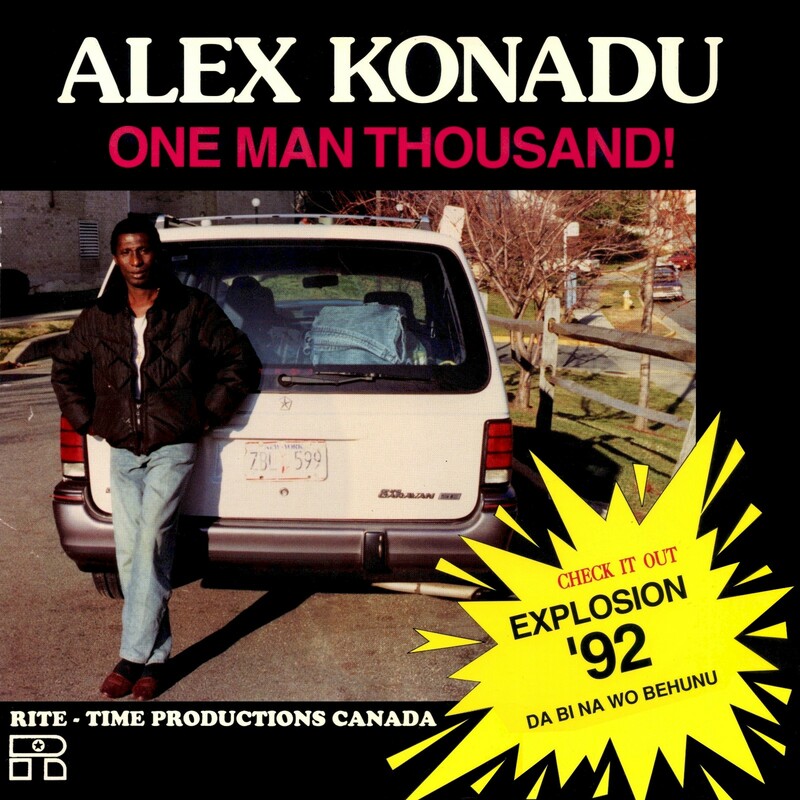 In the late '80s Thomas made the journey to Toronto, joining a vibrant Ghanaian exile music scene which included at times musicians like A.B. Crentsil, Alex Konadu and Joe Mensah. 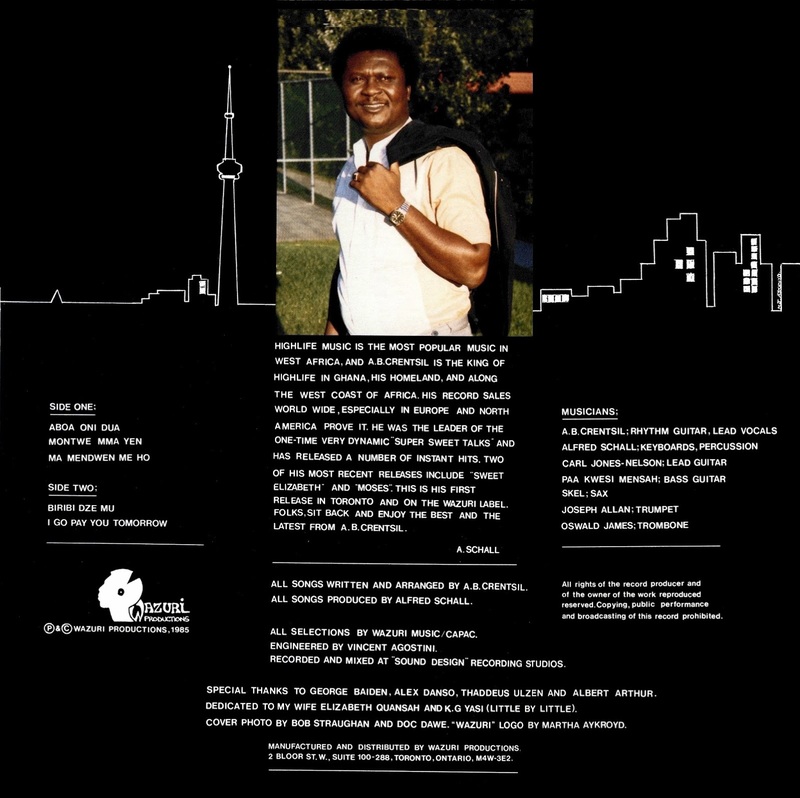 He would remain in Canada for ten years, returning to Ghana in 1997. 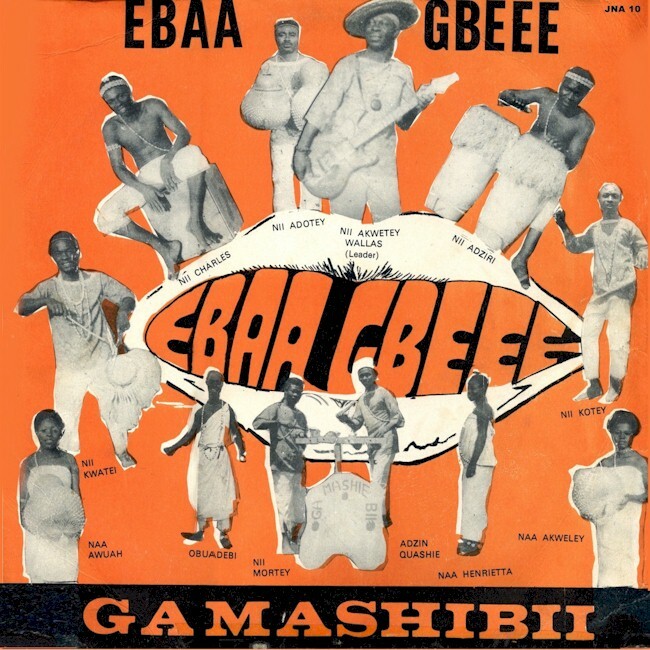 Although it was recorded in Lomé, Togo, 1986's Highlife Greats Mbrepa (Jap Records JAP 0102) was released in Canada and is a product of this fertile period. It's a great album, which deserves a proper reissue. Perhaps tracks from it will be included in a future retrospective. For now, though, enjoy! 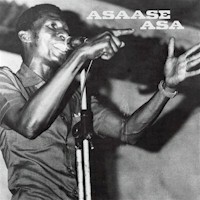 Download Highlife Greats Mbrepa as a zipped file here. The Ramblers, the last of Ghana's great "danceband highlife" orchestras, were founded in 1961 when Hansen left King Bruce's Black Beats. Their innovative sounds held them in good stead through the political upheavals of the 1970s and ínto the '80s when the band finally expired thanks to changing tastes and poor economic conditions. Download Ramblers International as a zipped file here.